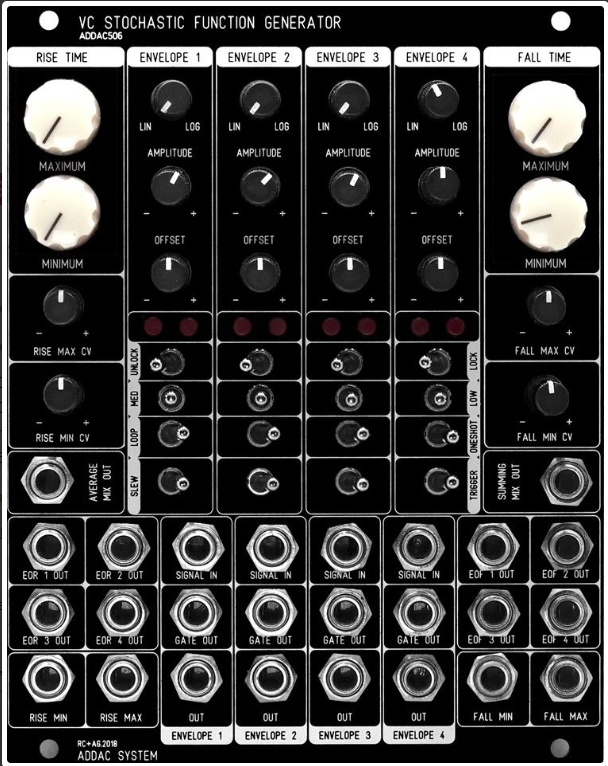 Hi, is there sth comparable to this great Stochastic M4L Took in Eurorack form? The M4L plugin lets basically lets you set a general resolution (1/16, 1/8...), Scale and Weighting of how likely the individual Keys are triggered compared to each other. Note lengths and Velocity randomisation are also possible. The two modes absolute and relative also determine how often notes are triggered. Its great for organic patterns with run in a certain ordered chaos. Here is an example where I used the Plugin on an MS20 Bass Lead, its the first Element heard throughout the jam. In this example I recorded and looped a midi sequence generated by the plugin. Happy for all the input! Don't know about a module but I'm gonna have to try and patch one now. You mean like the below? What about Rebel Technologies Stoicheia? There was also a stochastic trigger sequencer called Pythoprakta (or another Xenakis name). Combined with the ADDAC 506 above, you'd get closer to what you want! Once you start using these kind of tools you are bound to want more, so for everything algorithmic in euro my answer will always be Teletype. It is very very easy to program and it has a communitity that doesn't feel threatened or hostile to help (as it is usualy in a max forum for example). he, this one ive stumbled across, but isn't it missing like the whole "musical" part of the m4l patch, like randomisation of notes, scales, rhythmic context etc.? looks like a mighty tool for sound design and altering tho. Absolutely sick and ahead of its time (still). I can only imagine how much fun it would be to be a bored orchestra musician getting into a project like this! Ive had a free software for MacOS that operates like this; drawing pitch, length etc. Absolute lovely way of creating soundscapes! this module looks sick! but im just getting into eurorack and want to start with sth really hands on. One module that seems to get close to what I'm looking for is Marbles. The ability it to Record user scales by simply putting them in by a Keyboard seems really nice. The use of the "probability" knob orders the input from notes that have been played the most to those who have been played the least. Can someone confirm if its usuable in a more musical context rather than pure chaos? Some vids in this sense would be very much appreciated. The Pithoprakta is still in production and available for purchase here! This page has a bunch of videos of it in use. Combined with S+H or quantizers, it can cover randomization of note values, velocities, and rhythms, and the Div mode gives access to the divisor resolution (1/8th notes, 1/4 notes, etc.) aspect that the OP mentioned. I'm happy to answer any questions about how it may fit into your music/workflow, Rost + Licht. There you go. Thanks for chiming in Taylor.